Assists with Healing & Balancing the Emotions; Clears, Aligns & Opens the Heart Chakra Allowing More Love for Self & Others; Enhances Inner Strength, Compassion, Empathy; Facilitates Connection to Mother Earth, Divine Love & Your True Self; Encourages Forgiveness, Self-Love & Peace. Ayahuasca Medicine – Vine – Master Healer from the Amazon. Facilitates true healing that puts into order the body, mind and spirit with the past, present and future. Assists with a deeper vision. 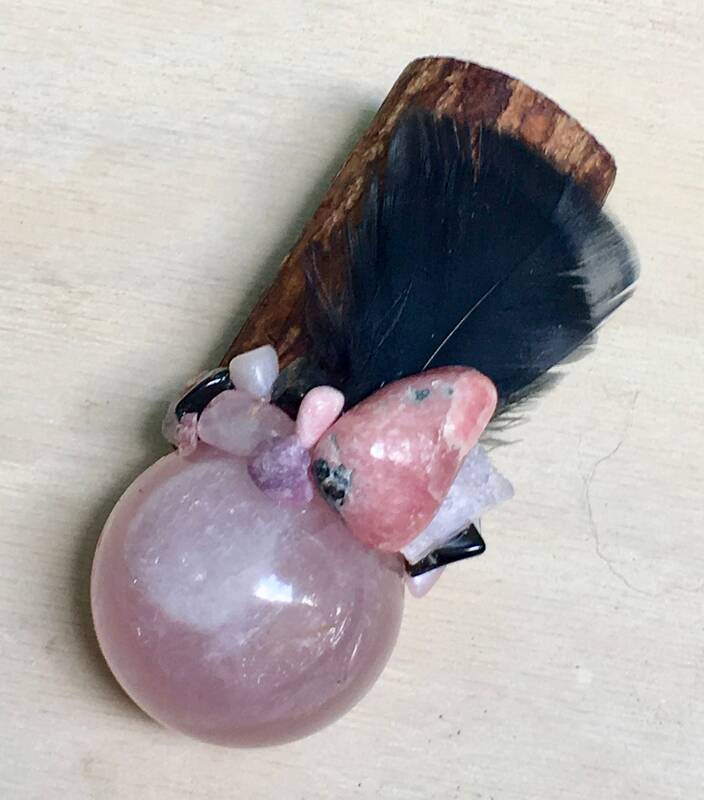 Rose Quartz – Stone of Unconditional Love and Infinite Peace; purifies and opens the heart; brings deep inner healing and self-love; strengthens empathy and sensitivity; aids in releasing unexpressed emotions; invokes forgiveness and acceptance. 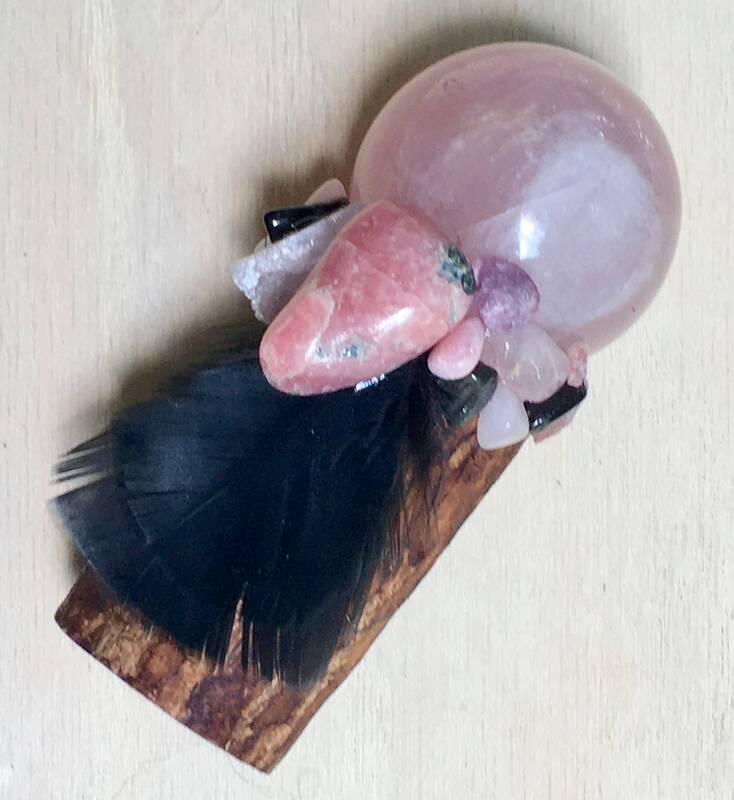 Rhodochrosite – perfect for balancing emotions; cleansing and balancing the Heart chakra; promotes acceptance of the past; assists in loving the self; assists in releasing self from blame, invokes courage, will & passion. A powerful emotional healer, radiating a strong energy of Divine Love; Deepens connections and love for Pacha Mama (Gia). 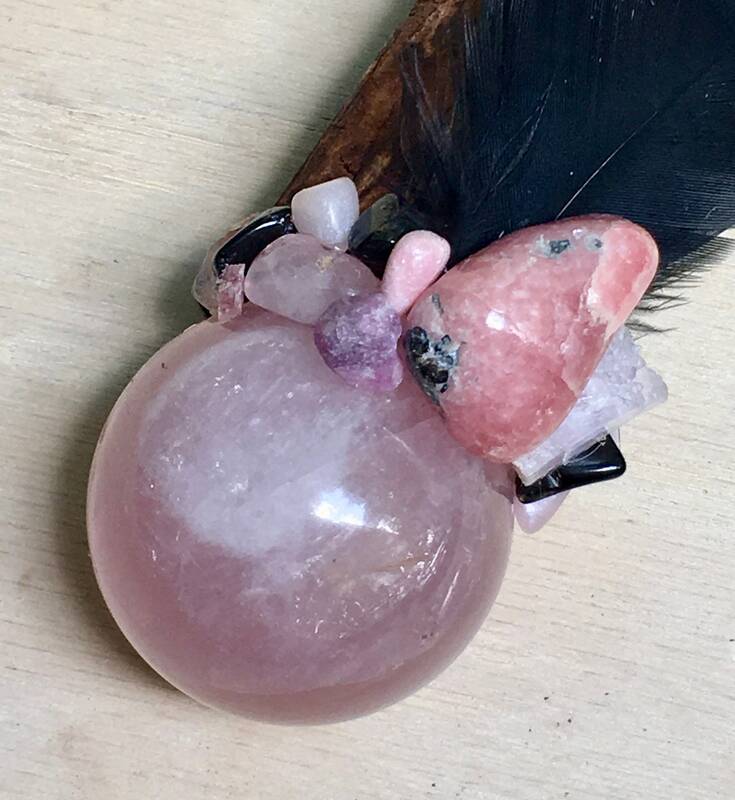 Kunzite - is a Stone of Emotion, opening and connecting the heart to the mind and stimulating a healing communion between the two. Encourages one to release walls built around the heart for protection, and to be receptive to the experience of unconditional and abundant love. Releases tension and promotes joy. Black Obsidian - will shield you against negativity, and the energy of these stones may stimulate the gift of prophecy. Very connected to Gaia, therefore very grounding. Is excellent to assist you to release disharmony that has built up in your day to day life and during work on yourself, including resentment of others, fear and anger. 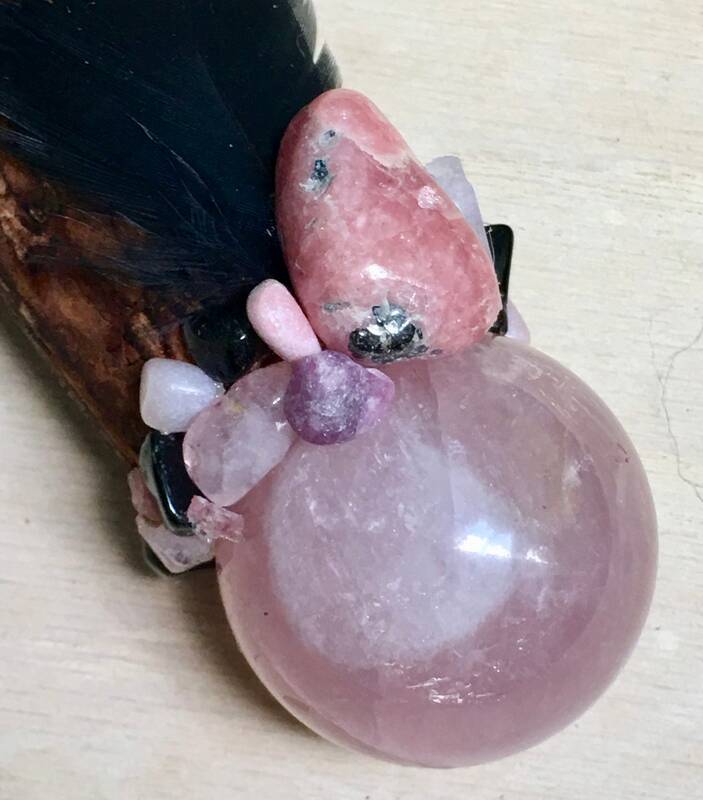 Pink Tourmaline (Rubellite) – great for self-love, compassion, promoting feelings of joy and enthusiasm; releasing old hurts; aids in trusting the power of love; allows you to embrace your inner strength, confidence and balance. Morganite - attunes to the heart and the Heart Chakra. It cleanses the emotional body of stress and anxiety, old wounds and hidden traumas, and enkindles lightness within the spirit, as if a burden has been lifted. It brings in the frequency of Divine compassion, inspiring the awareness that life’s suffering and pain served a higher purpose in our spiritual growth, and can be a catalyst for moving forward in peace and confidence. Also attracts the abundance of love into one’s life and assists in maintaining that love as it continues to grow. It encourages loving thoughts and actions, consideration and responsibility, and being receptive to love from others. 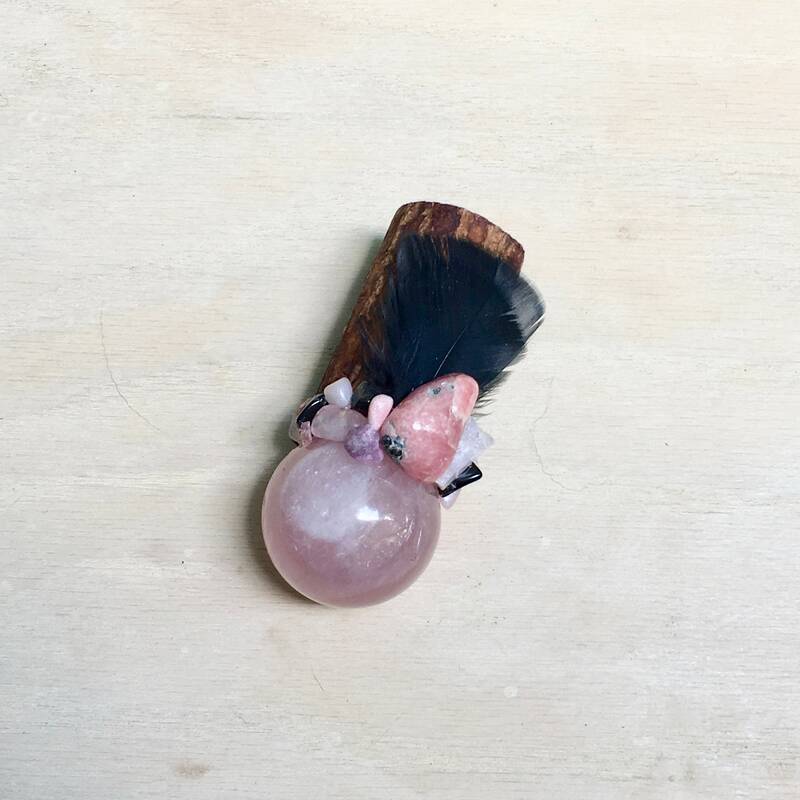 Pink Opal - a stone of love and gentleness. As with other opals, it also brings inspiration, imagination and creativity. It can help release inhibitions and brings happy dreams. It also eases the process of change. Helps to bring compassion and a gentle resolution of painful memories. Is said to be many things including the most powerful of healing stones, the stone of hope, the stone of great achievement and even the "stone of the Gods". 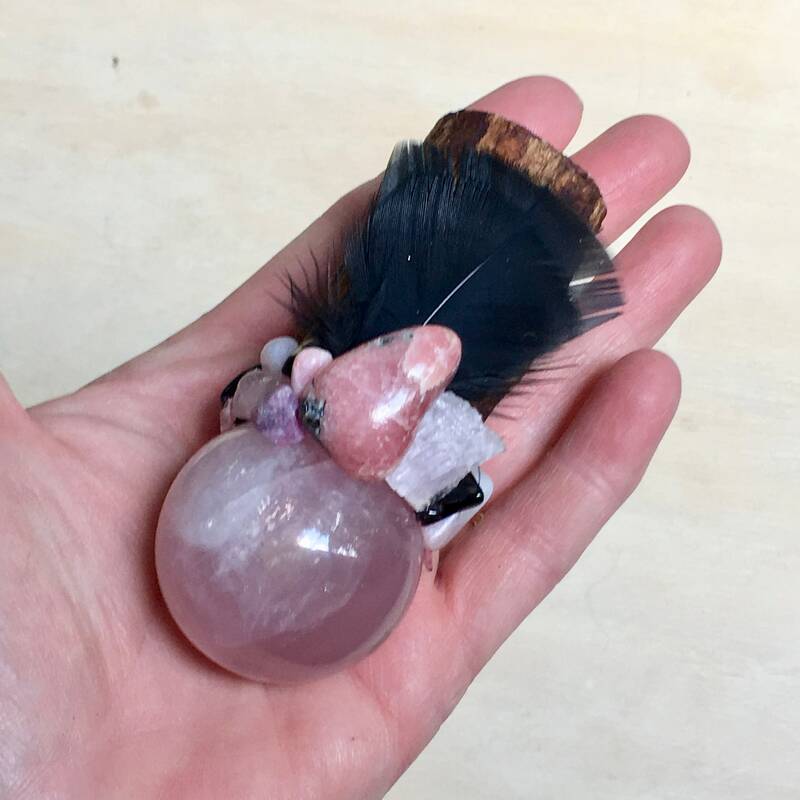 Mango Calcite (Pink Calcite) – Connects us to Divine Love and is a heart stone. It is associated with angels. Dissolves resistance. This is a soft stone of forgiveness that brings unconditional love. It is used to release fear and grief from the past. Assist in developing self-worth and self-acceptance. Heals nervous conditions. Lifts tension and anxiety. It is excellent for emotional healing as it can help shift long standing issues and support those with deep grief or trauma. Turkey Medicine - Feathers - a spirit animal closely associated with honoring nature and the Earth. Symbol of abundance, this totem animal encourages us to honor our sources of nourishment, whether they are physical, emotional or spiritual. Reminds us to develop a harmonious relationship with the land and our environment and consider them as foundations to our well-being and sustenance. A powerful guide to unlocking the fullness of life and feeling content with what we have instead of accumulating material belongings to seek happiness. 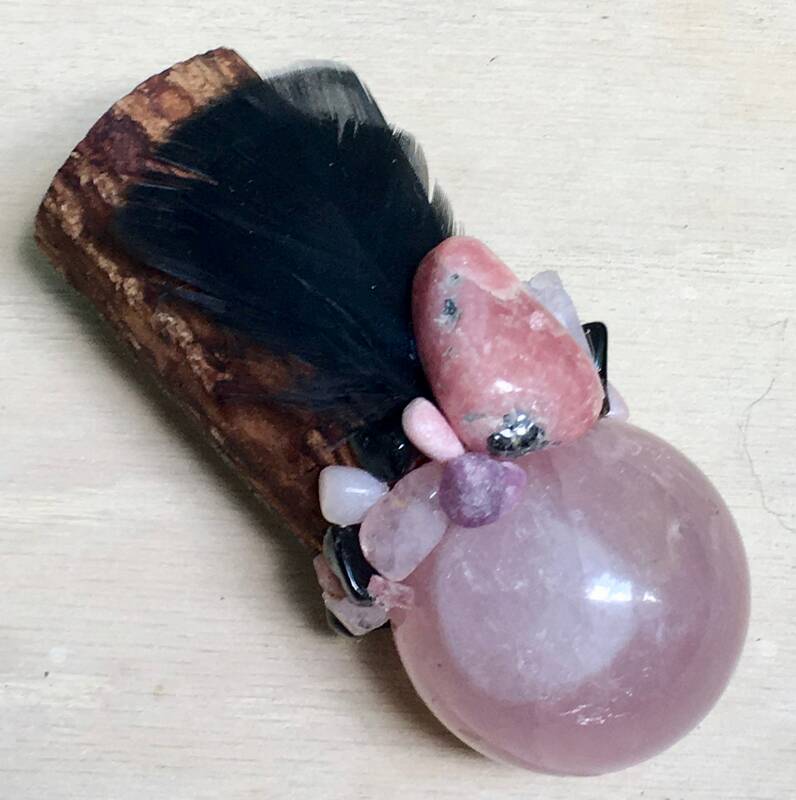 5.5 inches long; Rose Quartz 2.5 inches.